With bold styling, a chassis with Independent Rear Suspension (IRS) and our 500-class engine featuring Honda's advanced dual-range automatic Dual Clutch Transmission (DCT), the outstanding white Honda TRX500FA7 will get the job done. 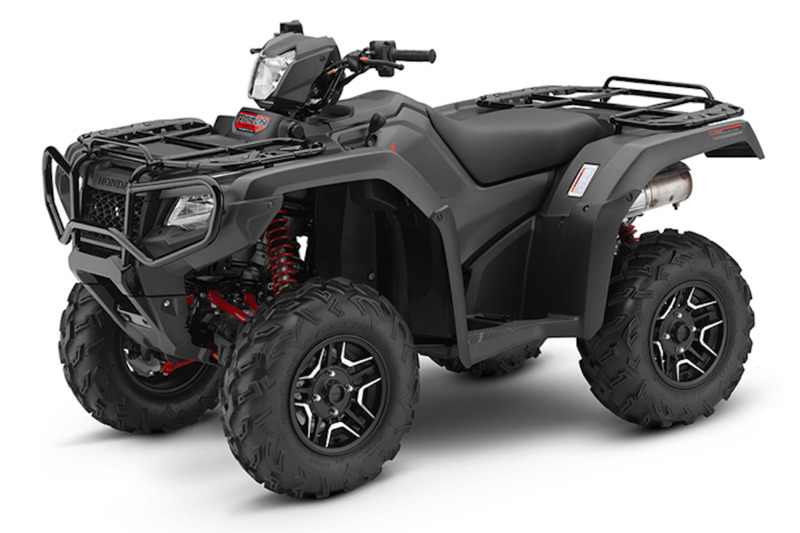 Honda's IRS dual-arm design offers an optimal shock ratio and increased suspension stroke for 8.5 inches of travel, providing more responsive handling, greater traction through the rear wheels, control and overall rider comfort. The automatic DCT provides the convenience of an automatic transmission with the strength and contact size of a manual, while giving the rider push button manual control options via Honda's Electric Shift Program (ESP®). The automatic DCT features a dual shift–mapping program that automatically selects between two transmission shifting modes–either Cruise or Sport mode–for the most favourable shift timing based on the rider’s throttle operation patterns. The Sport mode holds the transmission in gear longer before shifting for a more aggressive riding performance. For causal operation the Cruise mode shifts gears sooner for enhanced fuel efficiency during a more relaxed ride. Smooth power delivery and improved throttle response is supplied by Honda’s Programmed Fuel Injection (PGM–FI) system also aiding fuel economy for greater range. Honda TraxLok 2WD/4WD system offers 2WD, 4WD, and 4WD mode with locking front differential to optimise traction. TraxLok system incorporates a Speed Override mode that can be engaged when the front differential is locked, allowing increased wheel speed under severe conditions such as deep mud. Increased stiffness and better torsional rigidity are offered by the double–cradle steel frame, providing precise handling and a smooth ride. Front suspension delivers 185mm of travel with an independent double–wishbone set up. An increased rear suspension stroke of 216mm of travel, offering a more optimal shock ratio. comes from an independent dual–arm design. Varying loads and riding conditions can be easily matched with the adjustable spring preload feature available on all shocks. While the larger 190mm dual hydraulic disc brakes up front and 170mm hydraulic disc brake in back for strong stopping power. Independent dual-arm rear suspension design offers an optimal shock ratio and increased suspension stroke for 216mm of travel. Aggressive styling includes an all-steel full-coverage front bumper with integrated mounts for an accessory winch. All-steel front and rear carriers are larger and offer more load capacity: 45KG up front, 85KG in the rear. Flat plates on carriers facilitate loading and offer multiple tie-down points. Heavy-duty trailer hitch with 599KG towing capacity. Reverse gear is even easier to engage with the dual-purpose level including the parking brake. Simply pull the level to engage Reverse: push the level to set the parking brake. The seat is thicker, softer and sport-grip-textured for increased rider comfort and performance. More open rider triangle ergonomics for all-day comfort. Large, lightweight plastic fuel tank with 14.7Lt, including 4.9Lt reserve.